Trivia – Play trivia as individuals or as teams. It’s a great way to have a fun competition while guests arrive and it gets everyone involved. Keep the questions simple so that everyone has the chance to get one right. Category ideas include Christmas, entertainment and history. Croquet – If you’re experiencing an unseasonably warm winter like in the areas of the Northeast U.S., take advantage of it and get outside! 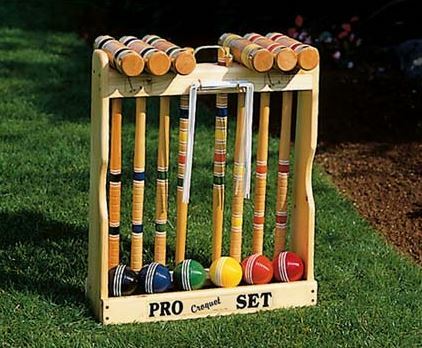 Croquet can be played while the ham is still cooking and it’s an opportunity to let the kids blow off some of their energy. You can play with as little as two people or as many as eight. Musical chairs – Waiting for the ball to drop at midnight? Keep everyone on their toes by playing a few rounds of musical chairs in the living room. There are lots of fun playlists available, and you can select the music based on your guests’ music likings, from Disney movie soundtracks to Christmas songs. If you haven’t put your outdoor furniture away in storage, this game could also be played outside. BINGO – This game requires some work ahead of the holiday party and will surely be appreciated by guests of all ages. You could do a Christmas-themed one or regular BINGO, and be sure to have a few small prizes on hand for the winner. 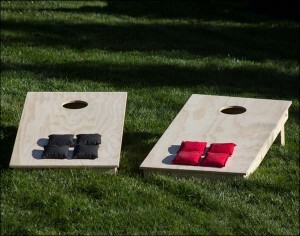 Corn Hole – This game can be played outside or in a finished basement. It can be played with two individuals or with teams. The game is usually played until one person or team scores 21 points, but your guests can play as long as they want. Looking for an upgraded croquet set or corn hole game? Fifthroom offers those and more. Check them out here.